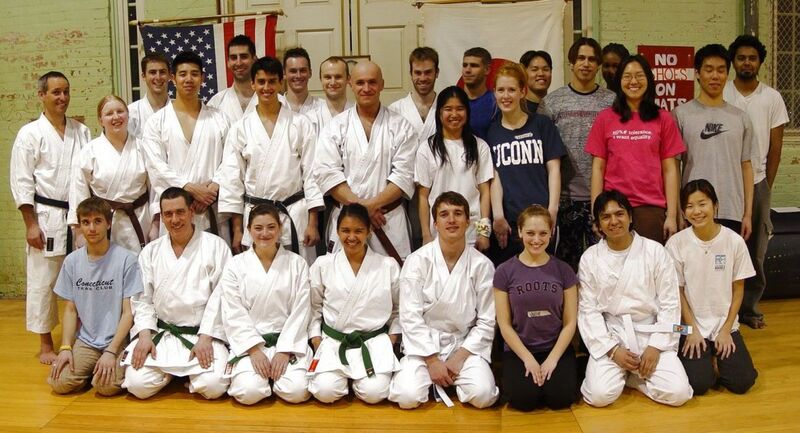 UConn Karate Club class group photo, March 2006. Front row sitting: Mike Russo, Brian Boyce, Brittany Perrone, Juvy Abarientos, Kyle Tucker, Julie Amenta, Andres Romero, Yixin Kalen Li. Second row standing: John Henderson, Laura Landry, Jeff Paine, Henry Huang, Dan Napier, Joe Vincente, Val Gorbatyuk, Mike Jacobs, Rob Terlikowski, Aurelien Carlier, Cara Chen, Ethan Clarke, Hilary Eurich, Jeffrey Li, Victor Batiz, Verona Thomas, Diana Deng, Rob Yau, Ryan Mangalram.